Thomas, the leader in product sourcing, supplier selection and marketing solutions for industry, today announced the first quarter winners of its new Thomas For Industry Awards program. 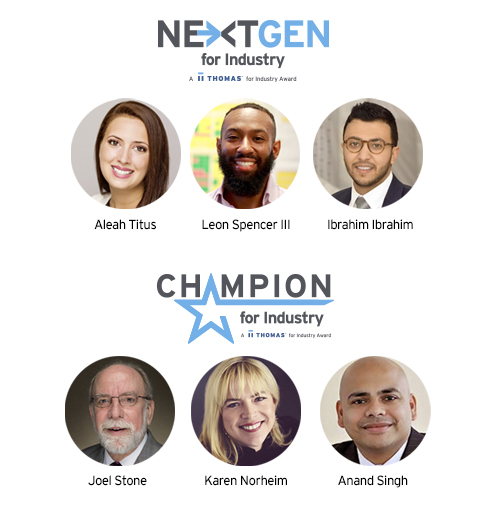 NextGen For Industry and Champion For Industry awards honor the best and brightest millennials as well as professionals of all ages that drive the manufacturing and industrial sectors forward. “It’s fantastic to see the talent, hard work and accomplishments of our winners acknowledged by their peers and industry. Each of these honorees reflect the remarkable work being done in today’s manufacturing and industrial markets. We extend our congratulations to these deserving individuals and thank them for setting the bar so high for future honorees,” said Thomas President & CEO Tony Uphoff. As the Local Product Group Supply Chain Manager for ABB Inc. in Richmond, Virginia, Aleah led a team that created a tool to prevent material shortages, a solution that led to a 90 percent on-time delivery rate from suppliers and a 100 percent delivery rate to customers. In her time with ABB, Aleah has successfully saved her company close to 5 million dollars. She is one of the youngest Supply Chain Managers at ABB. Read more of Aleah’s story here. As Aviation Operations Logistics Analyst for Shell, Leon is responsible for coordinating all material and personnel movement to and from oil rigs in the Gulf of Mexico. Not only is he a strong advocate for diversity, but he has already achieved many professional victories in supply chain management. In his first six months at Shell, Leon achieved over $600,000 worth of savings. To date, he has identified over $16 million in savings. Read more of Leon’s story here. Aviation Operations Manager at Lynn Welding, Ibrahim started his career as an intern in 2011. Since then, he has steadily progressed within the company and at 27 years old is now their youngest operations manager. Ibrahim has had to overcome many personal and professional challenges, including moving to the United States at age 18 with no knowledge of English. He now manages a team of over 50 people, working with high-level clients in the aerospace industry. Read more of Ibrahim’s story here. Chief Technology Officer and Board Chair at Fermentum, Joel was described by a colleague as “a visionary leader and change agent in industrial biotechnology, globally recognized as a sage in our industry.” He is a sought-after speaker and industry consultant, due to his experience as Chief Executive Officer, Chief Operating Officer, Senior Vice President, and Vice President of numerous food ingredient, animal health, enzyme, ethanol, and renewable chemical companies. Read more of Joel’s story here. As Executive Vice President at American Crane & Equipment Corporation, Karen has successfully revitalized and modernized her company’s culture. She created the GRIT Matters™ campaign, which provides employees with the ability to work through challenges together as well as share success stories. This initiative has enhanced collaboration across various departments, and as a result has led to increased profitability for the company. Read more of Karen’s story here. In his role as Director of Global Procurement for Philips, Anand strategizes ways to improve the medical device and accessories business by partnering with suppliers to bring new healthcare products to market. Using data insights, Anand and his team established a tracking system to discover gaps and opportunities in the market, which has resulted in 9.6 percent year-over-year (YOY) growth for Philips since 2015. Read more of Anand’s story here. Nominations are now open to honor leading industry workers as part of this ongoing initiative. Along with “bragging rights,” winners will be featured on the Thomas website, across social media and championed among their own professional networks. All employees, co-workers and individuals can nominate a colleague for consideration. To submit a nomination, please visit the Thomas For Industry Awards Site.